AHS CEO Delvecchio Finley addressing the board of trustees. At their board meeting this evening, trustees of the Alameda Health System, which operates the county's public hospitals, affirmed that they will continue to make healthcare services available to undocumented immigrants and other populations whose care might be imperiled by the incoming Trump administration. 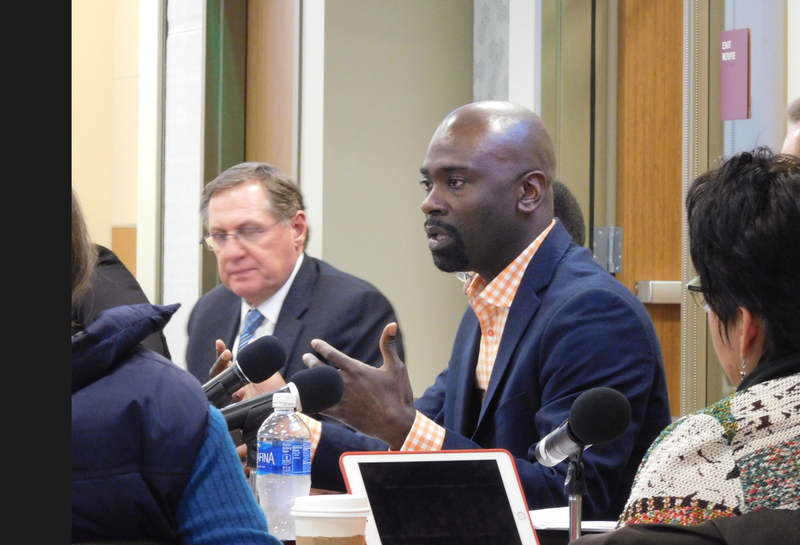 "It's clear a lot of our providers, patients, and staff are feeling heightened concern," AHS CEO Delvecchio Finley told the system's trustees. He noted that Oakland — where AHS' largest hospital is located — recently reaffirmed its status as a sanctuary city, meaning its police and other city employees won't inquire as to anyone's immigration status, nor cooperate with federal agents by enforcing immigration laws. "We'll try to be in lockstep," he said about such efforts. AHS Trustee Kinkini Banerjee said the hospital system should spread the message that its services are available to all. She said AHS should make sure immigrants know it is a "safe space." Graham Brant-Zawadzki and Erica Valdovinos. 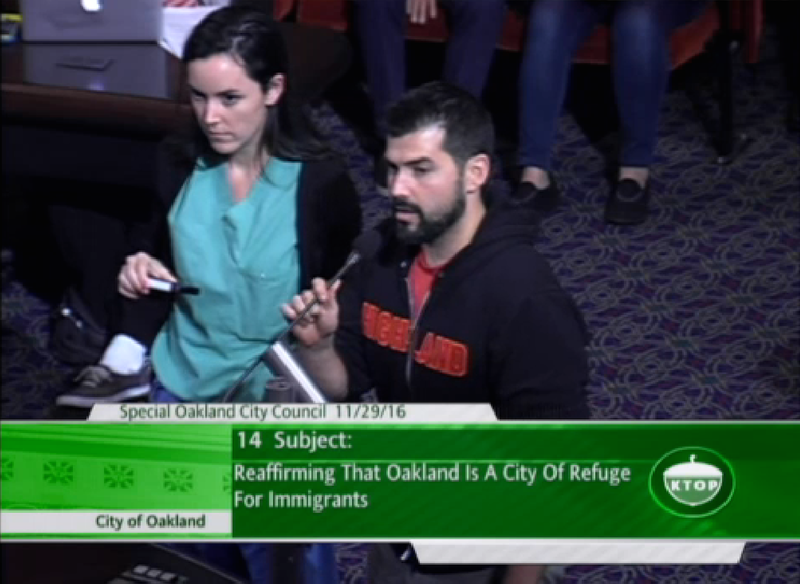 Last night at the Oakland city council meeting, two Highland Hospital emergency physicians, Graham Brant-Zawadzki and Erica Valdovinos, read an open letter from doctors in the hospital's emergency department. They stated: "as doctors, we will continue to care for every patient that walks into our emergency department regardless of immigration status, ability to pay, race, religion, gender identity, or sexual orientation." "We will actively resist and will not honor any legislation or efforts to discourage or limit people from accessing healthcare," they pledged. As to what the Trump administration plans to do to the nation's healthcare system, Finley told the AHS trustees that portions of the Affordable Care Act, or Obamacare, are surely going to be repealed. But he said it's hard to tell what parts of the law will be eliminated, and how this might affect low-income people and those who rely on Medicaid and Medicare. Regardless of how Trump and Republican majorities in the House and Senate act on healthcare, Finley said the mission of Alameda County's public health system will "be the same."